Willing to have a look at a life-and-death struggle? Yeah? 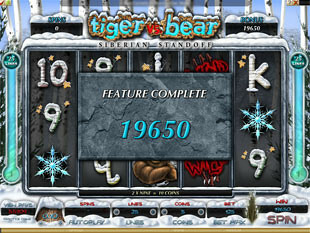 Hm… Then play Tiger vs. Bear slot machine created by Microgaming group and get ready to behold everything with your own eyes. It will be an unforgettable vision you can’t miss in any case. As you are able to win pretty good money supporting the powerful competitor. Are you the faint of heart? Then it’s better for you to make yourself scarce. Use all 5 reels and 25 paylines available to benefit from the slots to the maximum. Besides these points, you are free to test the durability of your luck playing Tiger vs. Bear video slot in a no download format. Aren’t you afraid of the bloody Wild sign appearing at the reels? Aha! Then grasp it quickly and keep a tight hold on it. As it is nothing but the Wild symbol that is capable to take the place of any other slots symbols apart from the Scatter symbol. If you manage to substitute at least one Wild symbol in a winning combo, the game will double your gained prize. Scatter symbol is Tiger vs. Bear Logo which can award you with $5,000. It takes you only to catch 5 Scatters at one go and you are a happy owner of this wonderful sum! Never mind if you can’t obtain 5 Tiger vs. Bear Logos for a long time… 2, 3 or 4 Scatters have the power to increase your total bet significantly as well. So, go on spinning the reels and enjoy your winnings every time! Play with the coin sizes which fit you most of all. Choose the one among the available denominations: $0.01, $0.02, $0.05, $0.10, $0.20. You should also adjust 1-20 coins per each line changing the gambling bets thereby. And so, the game provides you with the minimum $0.25 stake and the maximum one of $100. Do some first-rate work and spin the reels in a way to catch 5 Tigers or 5 Bears at a time. Wow! You got them? Great! The luck smiled upon you! Well, our congratulations then. You won the most risky jackpot of 750 coins or $3,000. Are you satisfied? You will be even happier getting an opportunity to hold the slots reels in your hands. As today you may stop the reels any second you wish after noticing the necessary symbols for winning. Set Tiger and Bear at loggerheads hitting their symbols on the 1st and 5th reels. As soon as they can see each other, they start the internecine battle. 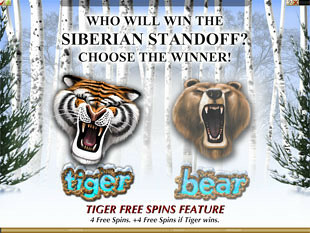 You consider this fight as Siberian Battle Feature that is able to bring you tempting Free Spins. First, you are to choose who you want to support: Tiger or Bear. Make this inevitable choice and pray for your favourite to win. Staked on the right fighter? Perfect! Gain 8 Free Spins then. But you don’t need to be sad if your chosen animal is vanquished. Anyway you will get an award of 4 Free Spins. Reveal the secret. 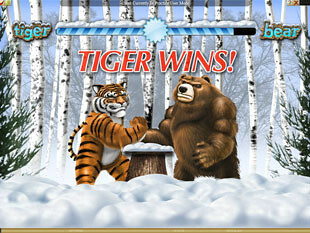 Did you select Bear and it gained the upper hand over Tiger? You are really fortunate as you obtain a 2x multiplier for the Bear Claw Feature. And… Voila! You are already among lots of claws asking you to pick them and enjoy their exclusive money gifts. But you are warned! Try not to open the Stopper claw. As it means the end of the lucrative feature. So, believe in Bear’s courage and increase the amount of your slots coins. 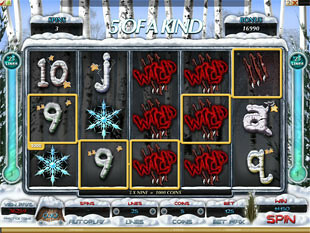 Moreover, you have a chance to catch Bear Claw Feature collecting 3 or more Bear symbols on the payline. 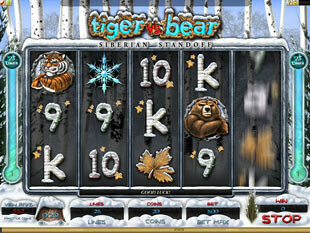 Gain a marvellous Tiger Feature and play with 4 Free Spins. Pay attention to the fact that Tiger swipes through the reels and sometimes turns them REALLY wild. Look! Tiger and Bear are already roaring at each other! Any minute they can rush to the attack and bite the hated enemy to death. So, why are you sitting still? Hurry up! 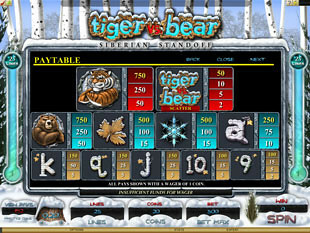 Launch Tiger vs. Bear slot machine and make your bet in favour of one of them. Win $5,000 or even more!